For the last few weeks, I’ve been thinking about CVNA’s big question: What is ONE thing we could do to strengthen the nonprofit sector in the Cedar Valley? It’s a question that seems easy until you stare at your blank screen waiting for an answer to fall out of your fingers! During my ruminations, I attended the CVNA workshop on improving boards of directors. Better boards could be a good answer to the big question. But that’s not the idea that emerged to me during the board of director’s workshop. Instead, I reflected on how proud I was to be affiliated with the speaker, Kari McCann Boutell. She’s a great trainer and an expert on boards of directors. 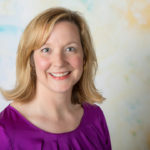 Kari is the President of the Iowa Council of Foundations, the go-to network for grantmakers in the state. The funders in her network have assets of $3.9 billion with grantmaking of $215 million annually. They are some of the strongest threads in the fabric of Iowa’s communities. Six years ago, Kari was the Gold Star intern at the McElroy Trust. At age 21, Kari was already experienced before she was our intern. She had managed a team of people in an international location through Camp Adventure, been a teen philanthropist through a program in her hometown, and served as the President of UNI’s Nonprofit Leadership Alliance the year it was noted as the best program in the U.S. Kari was ambitious and hardworking, in equal measure. She was just what I needed from an intern. The Trust provided Kari with a meaningful experience in philanthropy and a peek into the life of a foundation leader. Today, she uses her talent to influence Iowa’s philanthropic sector. I’m glad there’s a strong leader – who understands the Cedar Valley – in that role. Interns, when well integrated into our organizations, increase our productivity. At the McElroy Trust, we add an intern each January to help with an exploding workload. (Did you know we receive more than 1,200 nominations for Gold Star teachers each year?) Interns are more than production boosters. They well positioned to generate and test new ideas that improve our organizations. It was an intern, Annie Reiter, who convinced me that we should surprise Gold Star teachers like Ed McMahon. I was skeptical, but didn’t want to deter her enthusiasm. Our surprises are now one of the best parts of the program. It was another intern, Emily Hanson, who launched our email system saving us money and improving our responsiveness. She implemented the system with ease because she had already utilized it as the leader of UNI Dance Marathon. Last year’s intern, Alex Brookhart, moved Gold Star applications online. By watching her work we learned lessons that we’ll apply when we go to digital grantmaking this fall. The talent exhibited by the McElroy Trust’s interns is special, but it is not unique. Today’s interns, especially those coming through UNI’s Nonprofit Leadership Alliance are well prepared to contribute to the success of our organizations, often from day one. In fact, they likely know more about the intricacies of the nonprofit sector and its best practices than I did when I stumbled into my first job at the United Way as a political science major and college activist 20 years ago. We have great nonprofits in our community, and with a few improvements to our internships, we could set the stage for dramatic impact in our sector. One of the best ways to strengthen the nonprofit sector in the Cedar Valley is to take our internship programs to the next level. Compete. Strong interns have choices. Instead of competing for talent, organizations sometimes send the message that we’re granting a favor when we let a student spend hours and hours working with us. Create a premier opportunity by showcasing the learning, impact and connections an intern will gain at your organization. Write an awesome ad, spread the word to top students, and put your best foot forward in the interview. Expect more. Interns like Kari, Emily, Alex and Annie bring an impressive resume to their internship. Focus on their competence, not their age, when you determine their assignments. Make room for error. Help interns embrace the learning that comes with inevitable errors. A few years ago an intern failed to correctly enter a teacher’s nomination into our system. In turn, we failed to notify the teacher that he could apply for the Gold Star award. Ouch. The intern owned up to the error with the nominator and the teacher. Both parties responded with grace. I saw my part in the error too and implemented a few more double checks into our system. Show-and-tell. Part of the magic of an internship is access to experiences reserved for senior leaders. Take your intern to special meetings, share the secrets to your success, and introduce them to people who can open doors. Stop worrying about the tasks and start worrying about the supervisor. 98% of an intern’s growth is catalyzed by the way in which the supervisor transforms tasks into learning. Make time – every week – to translate work into meaningful learning. This is one of the areas where my own weaknesses appear. I’m not a person who likes regularly scheduled meetings. But, I’ve learned the hard way that skipping weekly meetings sets the intern up for failure, creates misunderstandings and shortchanges their learning. Pick one thing. We all crave responsibility and ownership. Carve off an important piece of work and make it the centerpiece of the internship. You’ll draw better interns and see better performance. It’s better the second time, and the third. Once you find a project that makes a great internship stick with it and make the internship and that project, a centerpiece of your organization. Find a way to pay. Recent research tells us that students will forgo pay for a great internship experience. But, without pay they will compensate in ways that will degrade their experience and yours. They’ll take a second (or third) job. They’ll intern fewer hours. They’ll run so quickly that they’ll miss their chance to learn. I recognize that it’s easier for our organization – a funder – to pay our interns. You’re right. But, I have also noticed a handful of organizations in our community, large and small, that are prioritizing resources to support interns and getting great candidates in return. Find a way to pay, really. We limit who can participate in our internships, and ultimately our sector, when we do not pay our interns. Paid employment is not a nicety for college students. It is a necessity. Paying interns is a crucial step to making the nonprofit sector more inclusive and equitable. Channel Yoda. On the first day of a person’s internship they are a student. On the last day, they are a professional. You are one of the most important guides in their transformation. With my first several interns, I didn’t recognize this responsibility. I thought my job was to build an intern’s skills and pad their resume. I was easily frustrated by what they didn’t know and what they struggled to learn. Over the years, I’ve come to think of my job as helping an intern find their path,notice their super-powers, and identify what they think is going to limit their potential. Being a guide doesn’t always go smoothly, and I don’t always do it well. But, after 11 interns, I know it’s worth doing. While I think interns are going to make your organization better, that’s not the real reason why I want our sector to take internships to the next level. I want us to take our internships to the next level because the problems that we are trying to solve are difficult, complicated and even wicked. We will not make the gains our community deserves without engaging the country’s most talented young people in our sector. Internships are our doorway to inviting passionate and talented people to make their career making a difference. It is today’s intern who will be your legacy tomorrow. I count myself as one lucky person to include Tiesha, Aubree, Chris, Annie, Audrey, Kari, Alyson, Emily, Cheltzie, Sarah, and Alex as part of my legacy. I am grateful for the talent they shared with the McElroy Trust and the Cedar Valley and the positive change they continue to make in the world. Your turn: An invitation: We’d LOVE to hear YOUR ideas about ideas that could help the nonprofit sector to grow and improve. Send us a quick note with your answer to the question: What is ONE thing we could do to strengthen the nonprofit sector in the Cedar Valley? We’ll select several ideas for longer opinion pieces to share on our website and in our newsletter. Please contact Stacy Van Gorp at vangorp@mcelroytrust.org or Holly Dusenberry at coordinator@cedarvalleynonprofitassociation.com if you have an idea to share.